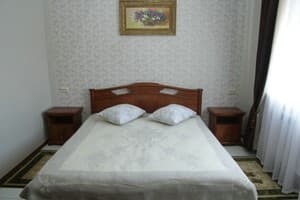 Comfort Hotel is located in the center of Kovel. The hotel has 12 rooms of different categories. Each room is equipped with a refrigerator, a modern flat-screen TV and a private bathroom. The suites have air conditioning. Free WI-FI access is available throughout the hotel. For the comfort of guests there is a round-the-clock water supply. Distance from the hotel to the nearest cafe - 250 m, to the store - 100 m. Guests can park their car in the guarded parking lot near the hotel. Guests can relax in the gym. The hall is equipped with running tracks and other sports equipment. 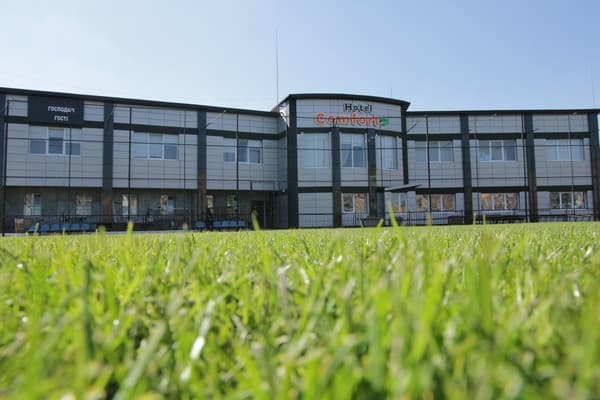 Hotel "Comfort" is located 600 meters from the railway station, 750 meters from the bus station. Description of the room: The compact room is equipped with two separate beds. Description of the room: Room with two separate beds. Description of the room: Mozhlivіst zamovlenya one додаткового місця у номері (the service is available for okremu fee - 100 UAH). Description of the room: Superior room with double bed. Description of the room: There is one double bed in this type of room. Description of the room: The luxury room is equipped with a double bed. Description of the room: The two-room suite is equipped with a double bed and a sofa. Сервис на отлично. Рады, что теперь есть такой отель. Очень приятное место для отдыха. Possible extra beds for an additional fee (service fee). Distance from the hotel to the nearest cafe - 250 m, to the store - 100 m.
Comfort Hotel is located in the center of Kovel. Hotel "Comfort" is located 600 meters from the railway station, 750 meters from the bus station. From the city of Lutsk by bus or car on the highway E85 / M19.